FARMERS ACROSS India joined in a countrywide general strike earlier this month to protest against what a representative called the government’s “failure to address rural distress issues”. This was far from their first such protest. In November 2018 over 100,000 farmers marched to Delhi. 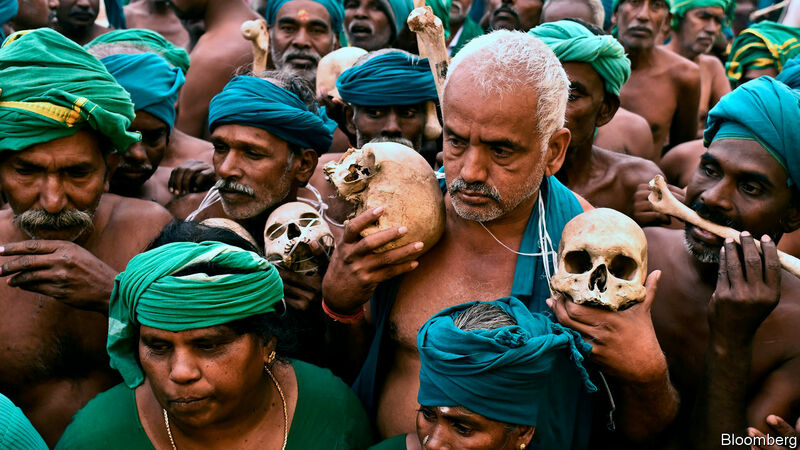 Some wore skulls around their necks to represent the 12,000 debt-ridden colleagues who commit suicide annually. The previous march, outside the capital in October, was met by water cannons and tear gas. In another, farmers held dead rats in their mouths to highlight their desperation. In north and west India, they spilled thousands of gallons of milk and truck-loads of onions onto the streets. Why are they angry? The last few years have been grim. Monsoons from 2013 to 2015, and again in 2018, delivered below-average rainfall. The messy overnight recall of high-denomination banknotes in 2016 made it harder for farmers to buy seeds and fertilisers just before the crop-sowing season, and also caused problems for providers of labour, transport and distribution services. The implementation of a nationwide goods-and-services tax in 2017 reduced farmers’ incomes by widening the array of taxable goods to include things like chemical fertilisers and pesticides. And with fuel prices near an all-time high, the extra expenses of diesel-guzzling water pumps and generators added to the hardship. The farmers are demanding an increase in the minimum support price (the price that the central government guarantees to pay for all farm produce should the market price drop any lower) and improvements in the systems to pay those monies. There are not enough government-run centres to buy farmers’ produce; those that do lack storage facilities. And because the centres are not always adept at finding buyers, farmers routinely have to queue for days to get a turn to sell their stuff at the minimum support price. With every day spent away from the farm denting their earnings, and with payments by the government taking up to three months to arrive, farmers may prefer to sell to private traders. They get less money but are assured of instant cash. Additionally, farmers’ demands for unconditional loan waivers have been only partially assuaged by the announcement from eight state governments of debt relief worth 1.9trn rupees ($26.8bn). On-ground implementation has been patchy. Millions of eligible agriculture workers have yet to see the money. Moreover, such windfalls do not help the smaller farmers who own nearly 70% of India’s farmland and have little access to formal credit. As banks and financial institutions are loth to lend to them, they rely on local moneylenders who charge exploitative interest rates. There are no easy answers for the 600m Indians who depend on agriculture for their livelihood. First, the water crisis needs addressing. Nearly two-thirds of land under cultivation has little or no irrigation. The country’s 20m boreholes, up from tens of thousands in the 1960s, deplete groundwater. Since 2016 the government has sunk 400bn rupees ($5.6bn) into a “Long Term Irrigation Fund” that is riddled with bureaucracy and delays. Smaller steps like introducing rainwater-harvesting to trap monsoon run-off and building check dams on riverbeds to improve groundwater levels would have helped instead. No matter. Narendra Modi vows to double farm incomes by 2022. Farmers, fed up with fancy projects and false promises, have threatened not to vote for Mr Modi in next year’s general elections. After his ruling Bharatiya Janata Party lost, in December, in three Hindi-speaking states of Madhya Pradesh, Rajasthan and Chhattisgarh, the threat looks ominous.